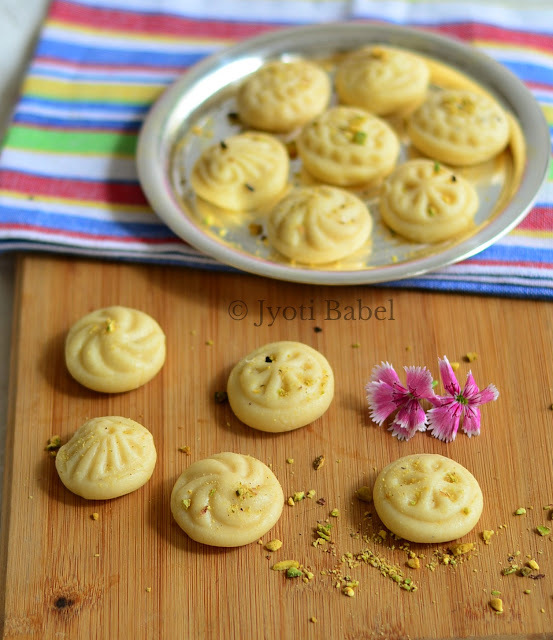 Peda is rich milk fudge flavoured with cardamom or saffron. It is also one of the favourite sweets of Lord Ganesha. So, it sells like hotcakes during Ganesh Chaturthi. 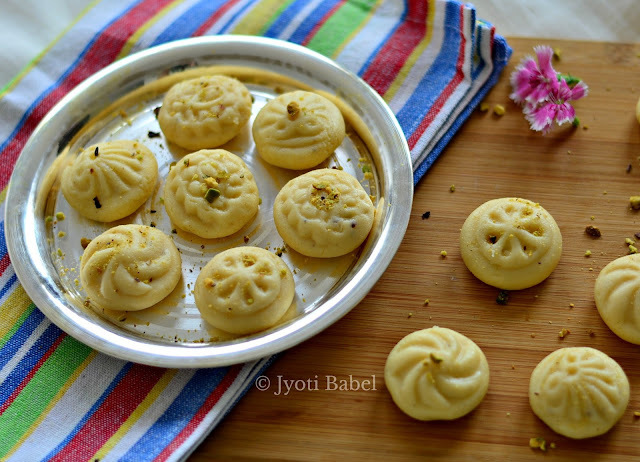 For the 2nd day of Week 4 of Blogging Marathon under the theme ‘Special Day/Festival’, I am posting the recipe for this much loved Indian sweet – Peda. Traditionally Peda is made with khoya and sugar. Making khoya from milk is a painstaking process where you have to heat milk on low flame for a prolonged time so that all the liquid from the milk evaporates, leaving behind a dense and rich khoya. My mom makes peda from scratch and it is really a long process. You have to be really patient to make it that way. The recipe I am sharing today is quite instant – by using milk powder and condensed milk you can prepare delicious peda in just 15 minutes. I browsed a lot of YouTube Videos before finally trying it out. The first time I tried it, I heated the mixture little longer than necessary, so they came out little hard – but they tasted good nonetheless. So, I tried it again and this time they came out semi-soft but not soft like malai peda. But, they were good enough. 1. In a non-stick pan on medium flame add ghee. To it add the milk powder and condensed milk and using a spatula stir well such that the mixture is uniform and well mixed. 2. Keep heating the mixture on medium heat for about 10-12 minutes and using the spatula keep tossing and turning the mixture as it cooks. 3. Add the cardamom powder and mix well. Take it off heat. At this point, the mixture should resemble smooth soft dough. 4. Take the dough out into a clean bowl and let it cool down a little. 5. When the dough has cooled enough to handle (but not completely cold), grease your palm with little ghee and form small bite-size balls. 6. I used terra cotta moulds to get the design impression on the peda. If you have such moulds, you can do the same. Else you can just flatten the balls a bit and put a finger impression. 7. If you like you can garnish them with chopped pistachios. 1. These pedas were semi-soft with a chewy taste – but not soft like malai peda. If you like these a little hard, you can heat the mixture for another 5 minutes. 2. It is very important to keep stirring the dough while cooking, else it can get brown. The recipe sounds great , somehow I have never made pedals at home , you are inspiring me to start making them with your quick version . I love the way you have used that mould to decorate them , very professional . Beautiful design on the pedas Jyoti. I often make the quick version of pedas when I have to take some prasad for a satsang. I love those designs on the peda. Looks like a wonderful sweet for any festive occasion. I really like the designs on your pedas. wow jyothi love the designs yaar! can you share the details about the moulds? Pedas look so very professional!!! These are great for gifting during festive season!